Here at Twin Oaks Community Foods, our mission is to help the planet by providing people with healthy, protein-rich food that is a delicious alternative to meat. We strive to incorporate eco-friendly practices into our tofu production process, such as heating water with renewable energy and reusing the nitrogen-rich “waste water” byproduct as a fertilizer on our intentional community‘s fields. We also seek to encourage collectivism and democratic decision-making by being an example of a successful worker-owned cooperative. Twin Oaks Community members. Photo by Brad Kutner. 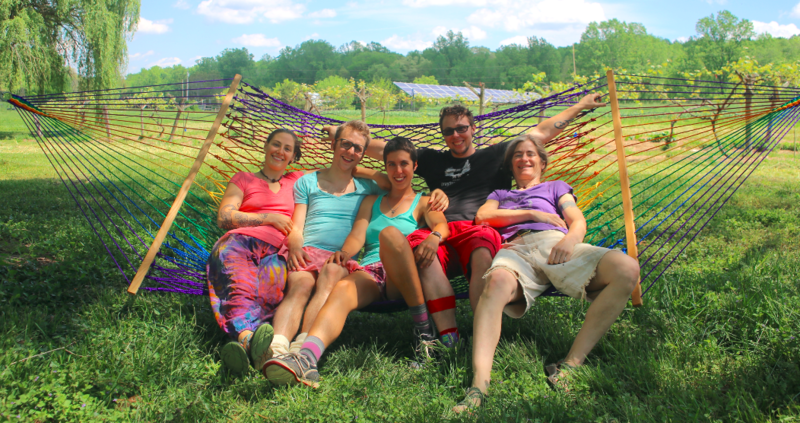 Twin Oaks Community Foods is a cooperative business run by the members of the Twin Oaks Community, an intentional community on 350 acres in rural central Virginia. We are an “egalitarian,” income-sharing community, which means that our 100+ members pool what we earn through our community businesses. Besides soy foods production, which provides the majority of our income, our businesses include hammock-making, book indexing and seed growing. Here at Twin Oaks, we do not have a group religion; our beliefs are diverse. We do not have a central leader; we govern ourselves by a form of democracy with responsibility shared among various managers, planners and committees. We are self-supporting economically, and partly self-sufficient. Each able-bodied community member works 42 hours a week in the community’s business and domestic areas (such as the farm, childcare and cleaning). Each member receives housing, food, healthcare and personal spending money from the community. To get in touch with us, reach out on Facebook, call us at (540) 603-0738 or email us.